Heavy Duty Shed Felt is a bitumen fibre felt, but one that is typically manufactured with twice the amount of materials to that of a standard shed felt. Apart from being twice as thick as normal felt, the other noticeable difference is that the green mineral finish is made with coarser grains (2-4 mm). Heavy Duty roofing felts are not specifically designed for sheds. They were originally designed as the tough top sheet on a two layer flat roof system, but are used where a longer life expectancy is sought. 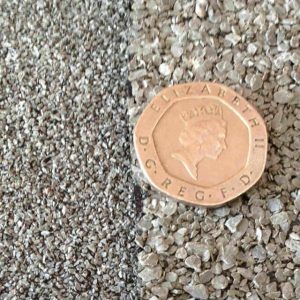 The green mineral finish on heavy duty roofing felt is larger than that used on shed felt. Different companies use different names to bring their product to market. Expect to see it called Garage Felt or even Trade Top Sheet. A good heavy duty felt will weigh around 35-38 kg and have a life expectancy of 10 years (twice that of a premium shed felt). Not surprisingly, expect to pay double the price! We have a great selection, Click here to browse our range of shed felts. Previous Previous post: Brazilian Roofing Slate: Trying to seperate the good from the bad?